Art Peck, CEO of Gap, Inc., on a recent call with investors declared stores to be "the deepest form of customer engagement" and praised their value as "a source for an immense amount of customer data." And yet, retailers struggle to give in-store shoppers the personalized experiences they have come to expect online. 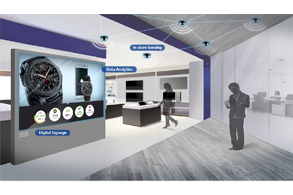 By enriching their knowledge with in-store behavior sensing and advanced analytics, retailers can continually improve operational efficiency, deepen customer engagement, and boost their bottom line. 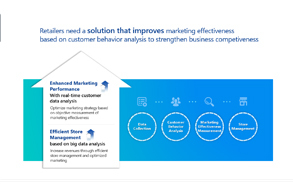 From data collection to store management, empower marketing effectiveness by analyzing customer behavior. Provide digital signage, data analytics, and in-store sensing to personalize the customer journey and enrich the retailer’s knowledge. 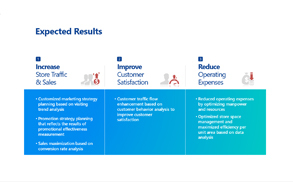 With customer behavior analytics, expect in-store traffic and sales to increase, improve customer satisfaction, and reduce operating expenses. Unless you consent to the above, we are unable to respond to the enquiry registered. however you can contact us by email at contact.sds@samsung.com. Copyright @2019 SAMSUNG SDS. All rights reserved.